From the original tamari sauce of the 7th Century to the Kikkoman soy sauce enjoyed everywhere in Japan today, there is no doubt that Japanese soy sauce (or soya sauce, or shoyu) has been an important part of Japanese cuisine for quite some time. This fermented mixture of soy beans, wheat, salt, and koji rice mould is one of the most widely utilised condiments in Japan, seasoning everything from ramen noodle soup to senbei rice crackers and spreading out to the local cuisines of other countries as well. Truly there is no substitute for soy sauce. These days there are a lot of different varieties of Japanese soy sauce from which to choose. As well as Japanese soy sauce being different in flavour to Chinese soy sauces, the four key ingredients in Japanese soy sauce (soy beans, wheat, salt, and koji) are also used at varying levels to make different types of Japanese soy sauce, including dark soy sauce, light soy sauce, low sodium soy sauce, and whole bean or marudaizu soy sauce. Continue reading to find out more about Japanese soy sauce, including its history, how it is made, the different types available, and exciting soy sauce recipes. Alternatively, browse through an incredible range of Japanese soy sauces by taking a look at japancentre.com’s Soy Sauce section. Soy sauce was invented in China between the 3rd and 5th Centuries AD. Originally made by fermenting different meats, fish, and salt, soy beans were soon added to the recipe, eventually replacing meat and fish entirely. This recipe was introduced to Japan in the 7th Century, from which time it evolved and diversified to become Japanese soy sauce as it is known today. Approximately 80% of all Japanese soy sauce is brewed using a method known as honjozo. In this method, roasted wheat and steamed soy beans are combined with koji mould (the fermenting agent), then placed in tanks with brine water, making an unfermented soy sauce solution called moromi. The moromi is left to ferment for 6-8 months before being pressed. The soy sauce liquid is then pasteurised and filtered before being aged or bottled and sold. Although this is the standard soy sauce production method, variations of this same theme occur depending on what type of Japanese soy sauce is being produced. Japanese soy sauces tend to taste slightly sweeter than Chinese soy sauces, owing to the Japanese innovation of adding wheat to the basic recipe. Japanese soy sauces often have a slightly alcoholic flavour to them, particularly when small amounts of brewed alcohol are added as a natural preservative. Accounting for over 80% of all Japanese soy sauces, koikuchi originated in Japan’s Kanto region and has come to be used all over the country (and in much of the rest of the world). Koikuchi is made from equal parts soy bean and wheat, and has a salty, deep umami flavour. It is the ultimate general purpose soy sauce that no Japanese pantry should be without. This lighter coloured soy sauce accounts for 10-15% of all Japanese soy sauce. Its recipe uses more salt than koikuchi, making the final product both saltier and less strongly fermented than most other soy sauces. Usukuchi originated from Japan’s Kansai region, and is best used for Kansai cuisine or for dishes that require a more subtle umami flavour. A darker type of soy sauce most commonly used in Japan’s Chubu region, tamari is the variety of soy sauce that most closely resembles the original recipe that came to Japan in the 7th century. It is the only Japanese soy sauce made without wheat, and it has a dense umami flavour that nicely compliments sushi and sashimi, as well as senbei and other grilled foods. This very light (dashi or tsuyu-coloured) soy sauce is made by brewing mostly wheat and only the smallest fraction of soy bean. It has a mild and uniquely sweet flavour, and its light colour makes it particularly ideal for dishes that would benefit from the flavour of soy sauce if not the colour, such as lighter coloured soups and chawanmushi egg custard. A relatively recent invention, reduced salt soy sauces are made by putting koikuchi soy sauce through a special fermentation process that retains flavour while reducing salt content by around 50%. These soy sauces are marketed toward the health conscious, and can be used just like regular koikuchi sauces. Unlike other soy sauces, which are made from a combination of whole and defattened soy beans, marudaizu soy sauces are made only with whole soy beans. They have a milder yet more complex flavour than standard koikuchi sauces, and are normally more expensive. These soy sauces are best enjoyed as a condiment for sushi or sashimi. Recognised as one of the largest and few genuine soy sauce brands on the market, Kikkoman has gained prestige and adoration around the world for its premium quality products. Their soy sauce is naturally brewed and as such offers 'an authentic taste of Japan' by enhancing the flavours of many different types of international dishes. Yamasa is one of the oldest Japanese soy sauce brands, well known for their expertise in producing top quality products. Their soy sauce was appointed the best grade possible by the Tokugawa Shogunate in 1864; an honour that is reflected by the use of the Japanese kanji 上, meaning 'above', that can be seen on the top right of the Yamasa logo. Japan Centre's Soy Sauce section offers a fantastic range of the best soy sauces from Japan and around the world. In every popular cuisine, there are three essential ingredients that make up the holy trinity, the cornerstone of flavours that give that classic, instantly recognisable taste. 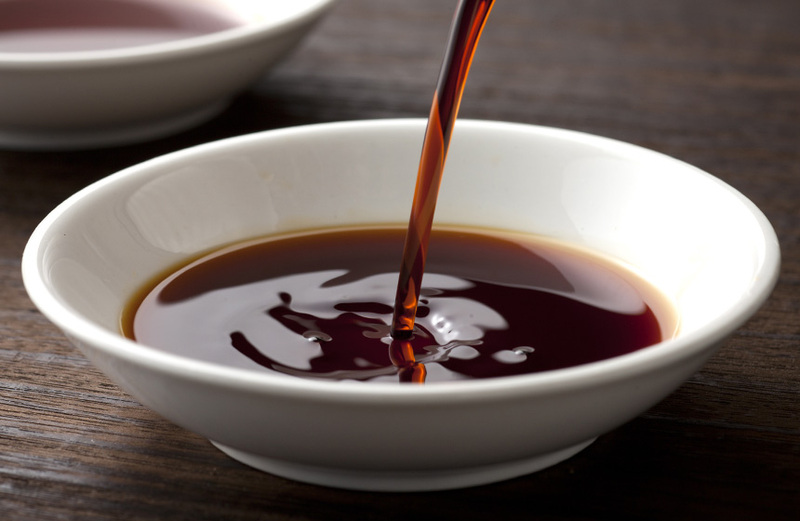 In Japanese food these three main ingredients are soy sauce, dashi and mirin.